What a great time we had hosting Gudrun Erla at Quilter's Garden. A big thank you to the 85 wonderful ladies who joined us for the inspiring presentation! We know we are going to become strippers and we hope you will join us too! 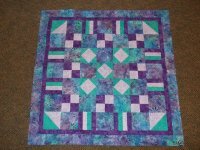 We still have the Stripology rulers and books - Strip Your Stash, Learn to Quilt-As-You-Go, Stripology 1 and Stripology 2. Of course we can special order any of the patterns that were showcased. We hope you all enjoyed her as much as we did! Join us for our Beginner Class - Saturdays, April 9, 16 and 30 from 10 AM - 2 PM. Cost is just $37.50. 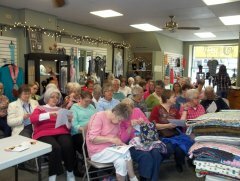 Here is what you will learn: rotary cutting, piecing, quilting, binding and everything we can possibly teach you in a beginner's class! Call us to sign up today!! !